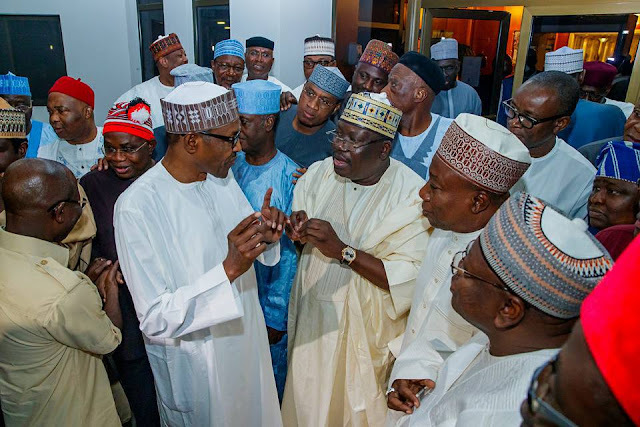 President Muhammadu Buhari on Monday evening met with some senators elected on the platform of the ruling All Progressives Congress. The meeting was part of ongoing efforts by the President to resolve the crisis that followed the primary elections of the party across the country. The meeting was held inside the President’s official residence inside the Presidential Villa, Abuja. Some of the senators who attended the meeting with the President are those who did not secure the party’s ticket to seek re-election to the Senate. They were led to the meeting by the Senate Leader, Ahmed Lawan. Those who attended the meeting included Senator Abdullahi Gumel, Senator Sani Mustapha, Senator Olanrewaju Tejuosho, Senator Gbenga Ashafa and Senator Ibrahim Kurfi. Others were Farouk Aliyu; Minister of State Aviation, Hadi Sirika; and Minister of Water Resources, Suleiman Adamu. The President had earlier met with aggrieved APC members in the House of Representatives. He had also met with members of APC Aspirants Forum. Buhari had also met with aggrieved state governors on many occasions.